Available now in Editorial Manager: your integrated dream-workflow! 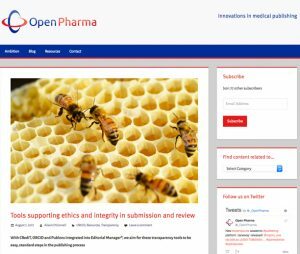 Did you know that Aries offers all journals using Editorial Manager free integration with numerous authoring tools and services (Overleaf, Editage & others) as well as preprint servers such as bioRxiv. 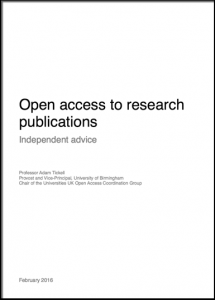 Implementing and growing Open Access Publishing programs represents alternative publishing options for authors, and new revenue streams for publishers. For this reason, the OA market was recently estimated to be growing at 10-15% annually, representing between three and six percent of the total journals market. 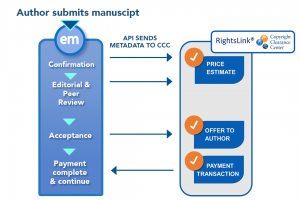 Editorial Manager’s integration with RightsLink for Open Access allows journals to automate the collection and management of APCs and other publication fees. It’s no secret that adopting standards has become increasingly necessary within Scholarly Publishing workflows. Similarly, Editorial Manager’s integrations with industry-wide standards are well known, and in use by thousands of journals. The March issue of ISMTE’s Editorial Office News (EON) Publication is freely accessible. 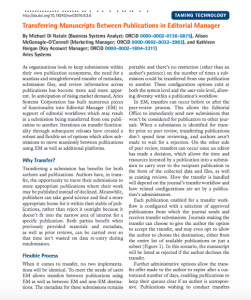 ProduXion Manager includes functionality that allows users to configure a production task to automate export of manuscript files to repositories, such as National Institutes of Health.